COSHH Regulations demand the safe storage of hazardous items. 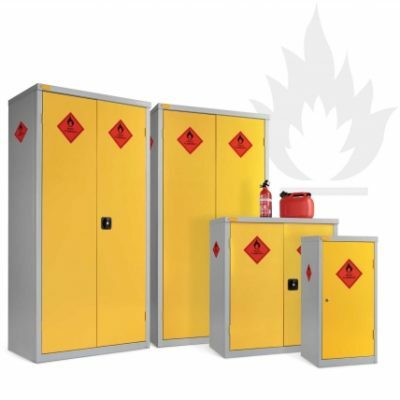 These cabinets isolate flammable materials and vapours from potential sources of ignition and clearly identify hazardous products in case of a fire. All cabinets are fitted with Smoke/Fire alarms fitted internally. Robust durable construction & Reinforced doors along with a removable 75 mm sealed sump base tray. Supplied with adjustable 85kg shelves. Additional shelves can be purchased please email us for prices. All units comply with HFL/LPG Regulations 1972 section 5 HSE The storage of flammable containers HS(G)51. Working towards many of the principals outlined in DSEAR Regulations 2002. High visibility 270 degree labelling conforming to BS55609. All cabinets come with Silver carcass and Yellow doors.